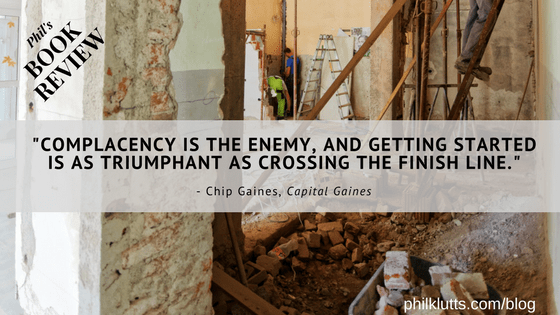 Chip and Dan Heath knock it out of the park again with this one. 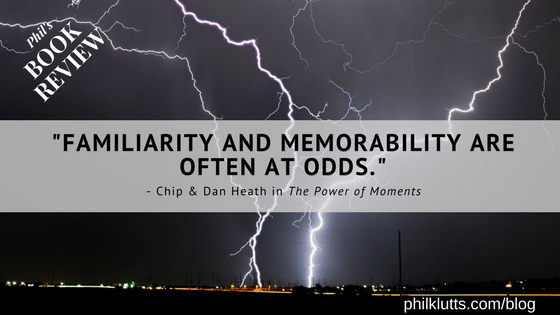 Experiencing positive moments is not all science, but Chip and Dan researched and came up with the four dominating traits of great memories. The four elements they define in the book are elevation, insight, pride, and connection. Each element gets a full rundown with stories, research, examples, and activities. Examples come from business, family, sports, education, and more. The book’s category is listed as Business and Economics. 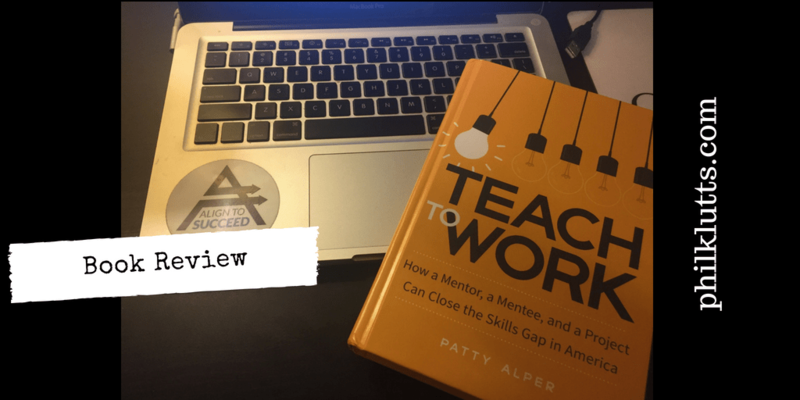 Although you could apply the lessons to these areas, it really is not a personal development, business, education, or leadership book. Moments can be defined and powerful for all areas of your life. I’ve thought of ways to apply the book as a husband, father, manager, teacher, friend, and neighbor. This book is perfect if you want people to remember an experience. Bottom Line: A good book for any industry or personal endeavor. Andy Andrews’ The Traveler’s Gift is one of the most engaging and enjoyable books I have read. So much so that I’ve read it 3 times in 2 years. It is a fairly short read, so don’t be impressed with my quick turn-around on it! “Seven decisions that determine personal success” is the subtitle of the book and doesn’t stretch the truth. I have gained personal satisfaction and success as I’ve incorporated these decisions into my life. Andrews is a great author and storyteller. He successfully puts his talents to work here to combine self-help, history, and fiction into a single book. Andrews writes the powerful story of David Ponder. He is on the brink of giving up his life after devastating circumstances crumble his success to nothing. He is thrown into a quest to receive 7 decisions from historical figures. These decisions show him the path to personal success. The decisions are written such that you can read each one independently of the story and get the benefit. But don’t short yourself by doing that. The context and story of David Ponder make the decisions even more powerful. In addition to the book, Andrews has many guides and extras available at www.andyandrews.com. Check those out too before or after you pick up the book. Many people are aware of the inverse relationship between risk and reward. Financial investments are referenced most often when talking about risk and reward. Low risk = low return. Many of our activities and decisions today are based on the concept of minimizing risk. Risk Management has become a huge business and we are always hoping to have certain outcomes we can control. Of course, this isn’t a phenomenon just limited to our modern day. Even back in the Bible times, people wanted to keep what they knew instead of risk a huge reward. In Exodus 16 the Israelites grumbled and complained because the risk was too great. They wanted to return to the predictable life of slavery because they were hungry. The reward of freedom and following God was not big enough for them to want to risk the discomfort involved. I often find myself shying away from rewarding activities due to the risk involved. Taking a stand, investing money, proposing a solution at work, and asking hard questions at home are all risky behaviors that I have avoided instead of accepting the risk and seeking greater rewards. My natural tendency is to be comfortable and not risky. I have had to learn how to foresee risk, plan for it, and work to mitigate it when I can. Planning and mitigating cannot manage away all of my risks but it does help! All of these things came to mind as I worked to spread a pile of mulch in our backyard. I almost injured one of our chickens several times as I swung my shovel back to the pile for another load. Clark (named for her explorer-like adventures) was the only chicken willing to be up close and personal with the business end of my shovel. She probably didn’t understand this topic of risk vs. reward, at least intellectually, but was willing to risk the shovel for the reward. What’s the reward you ask? Big, juicy earthworms! I would uncover big worms in the pile as I dug deeper into the pile of mulch. My shovel would get much deeper than the chickens could scratch and thus reveal the big worms before they could get away. Clark continues to roam the backyard uninjured. I continue to think about what I need to do accept more risk in search or reward. My thoughts are not limited to finances or business. I think about how I am seeking reward with my spiritual life. Matthew records Jesus telling us about this risk vs. reward in his gospel record. Jesus tells the parable of a man who entrusts bags of gold with his servants before he leaves on a journey. The servants who risk the money with investments gain a reward while the servant who hides his gold and earns no extra money is thrown out into the darkness. I don’t want to be thrown out into darkness. I also want to seek higher rewards in life and business. Learning to deal with risk is how to achieve these greater rewards. Learning to deal with risk means accepting small risks and losing occasionally. There is no single best answer to how much risk is the right amount for you. I know I am looking for ways to increase my risk tolerance so that I can enjoy greater benefits, even if that means losing sometimes.